There is hardly another major philosopher in whose work science and philosophy are so intimately intertwined than Aristotle. In notable contrast to even other scientifically minded philosophers - Descartes, Leibniz, Locke, Mach, and contemporary philosophers of science - Aristotle makes both areas of study influence the other. His conceptions of form, essence, cause, and knowledge are philosophical concepts, and they are responses to what Aristotle sees as problems of explanation in the sciences. 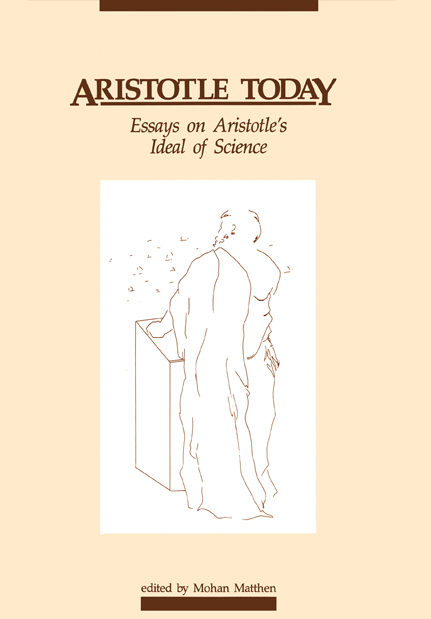 Aristotle Today explores the contemporary relevance of Aristotle's conception of a demonstrative science and his correlative conception of the structure of things in the real world. Contributors: Jonathan Barnes, Alan Code, S. Marc Cohen, Montgomery Furth, Mohan Matthen, Francis Sparshott.